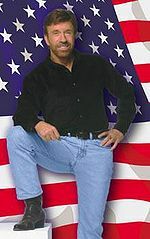 Chuck Norris refuses to bow to the homosexual agenda and instead remains true to the Bible. The Christian conservative Chuck Norris has refused to be taken in by the homosexual agenda constantly pushed by liberals, and so his views regarding homosexuality are based upon Biblical morality, as is to be expected from a genuine Christian. Norris wrote the following regarding the vote against the anti-homosexuality Proposition 8: "Bitter activists simply cannot accept the outcome as being truly reflective of the general public. So they have placed the brainwashing blame upon the crusading and misleading zealotry of those religious villains: the Catholics, Evangelical Protestants and especially Mormons, who are allegedly robbing the rights of American citizens by merely executing their voting rights and standing upon their moral convictions and traditional views." This page was last modified on 2 April 2019, at 01:33.